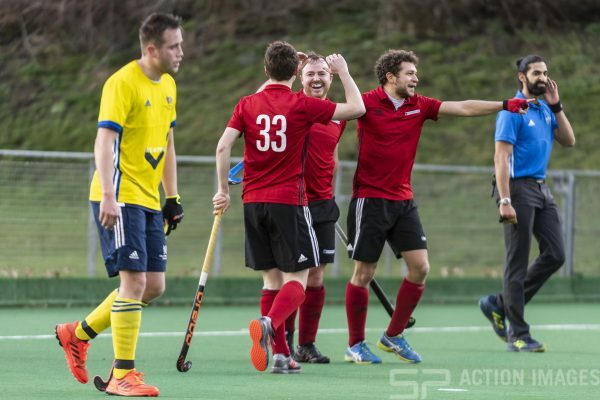 Putting last week’s disappointment behind them, the M1s bounced back with an emphatic 4-1 over City of Peterborough moving them back up to third place in the East Conference. Getting off to the best possible start, Southgate went one up after three minutes with John Sterlini converting a penalty corner. There were few opportunities for either side as the half progressed with Peterborough playing a more direct style as opposed to Southgate’s more patient play. The half ended in controversial fashion when Joe Warren picked up a ten minute yellow after going to ground while shooting. Southgate extended their lead in the forty second minute after some good work by Timmy Smyth found Matt Allister on the post to deflect the ball home. Peterborough were not done though, and got one back eight minutes later through Ben Newman. Southgate restored their two goal advantage in the fifty-fifth minute with possibly the goal of the season; Alex Williams picked up the ball in midfield and after accelerating past two defenders found Giulio Ferrini at the top of the circle, who in turn picked out Adam Grout on the back line, Grout crossed to find a sliding Brew Durkin at the far post to deflect the ball in. Southgate’s forth came three minutes from time after Timmy Smyth won the ball on the edge of the Peterborough circle, drove in beating a defender before spinning to find Matt Allister again on the far post for the deflection.